Streetly Smiles Dental Care is situated in the leafy suburb of the Royal Town of Sutton Coldfield in the West Midlands, and occupies the premises of a dental practice that was initially established in the 1960s. 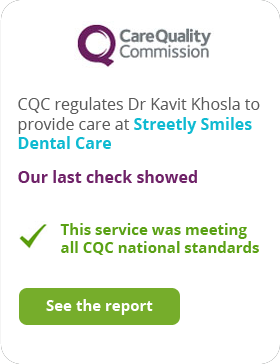 Here at Streetly Smiles Dental Care, we are committed to providing a high level of dental care for the whole family. Our aim is to understand your needs, and provide friendly and professional advice to help you maintain a better state of oral health. We emphasise the need to follow a preventative approach to your dental care, and provide different and modern treatment options that can ultimately reduce the need for future treatment. Your smile is our passion and whether you want to take care of your existing smile, or create a new one, we provide a wide range of treatments that can help improve the appearance of your smile. Our comfortable and homely environment, coupled with our warm and personal service, allow us to provide the very best care…so that you can keep smiling! If you have any questions you are very welcome to come on in and talk to us. For the convenience of our patients we are open one Saturday a month. Please contact the practice for more information.